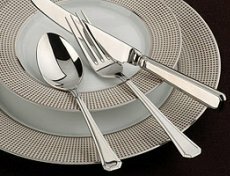 Cutlery is something that you will use more or less every day of its lifetime, it is therefore important to care for it correctly so that you can anticipate many years of good service. 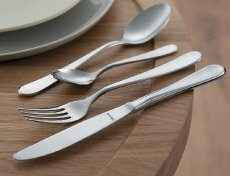 Philip Morris & Son have several ranges of cutlery from Arthur Price, Amefa and Stellar which incorporate classic and contemporary design styles and include knives, forks and spoons in a variety of sizes. Arthur Price have been at the forefront of the cutlery business since 1902, and with over 100 years experience and a family tradition which epitomises quality, design and craftsmanship they are certainly still worthy of such a position. Arthur Price use 18/10 stainless steel to make their cutlery, this is the highest grade of stainless steel and it is incredibly resistant to staining and rusting. Amefa offer the perfect balance of form and function. 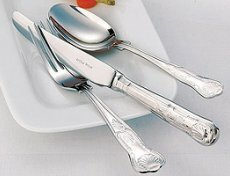 Amefa cutlery is available is two ranges, the Originals range which is made using 18/10 stainless steel and includes the Anise and Saffron designs, and the Monogram range which is made using high quality stainless steel and includes the Bead, Carlton, Harley, Neptune and Sure designs. Stellar was established in Bristol in 1896 and it is still a family run business, priding itself on traditional values and excellence in products and service. Stellar also use 18/10 stainless steel for their matt or polished finish Rochester design cutlery, except for knives which are made from 18/0 stainless steel to give a better cutting edge. Stainless steel is susceptible to corrosion if it is not looked after correctly. It is important to note that stainless means that the steel is stain-resistant, not that is is completely impervious to staining and marking, however, by following a few guidelines regarding care and cleaning it is possible to keep your cutlery in great condition for years to come. Stainless steel cutlery is dishwasher safe, although it is beneficial to rinse the cutlery by hand before putting it in the dishwasher. Do not mix stainless steel and silver plated cutlery in the dishwasher compartment. Silver has a different degree of electronegativity to stainless steel andelectrical contact between the two metals in a conductive solution can cause electrolyric corrosion. The damp and warm atmosphere of the dishwasher can cause corrosion if the cutlery is left in there for a prolonged period of time, therefore try to remove your cutlery from the machine as soon as the cycle has finished and dry it carefully. Smearing can be prevented by keeping the dishwasher rinse agent topped up to the correct levels. Prolonged contact with water can cause damage to your cutlery. It is best to wash your cutlery as soon as possible after using it, especially if you have had food that is particularly acidic or salty as this can cause pitting. Avoid using liquid bleach and make sure cleaning solutions are completely dissolved to prevent staining and smearing to your cutlery. Do not use scouring pads or other abrasives as these can cause scratching very easily. 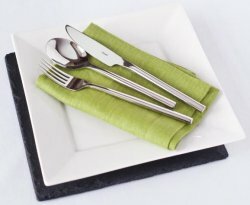 Once you have washed your cutlery, dry it as quickly as possible with a soft cloth. Avoid cleaning products containing lemon. Avoid using silver polish on stainless steel as the acidity of the solution will cause corrosion. If staining does occur, try using a soft, soapy cloth to remove the marks or a good stainless steel cleaner. It is important to appreciate that over time small surface scratches and scuffs will develop with use and this is natural and unavoidable. Amefa, Arthur Price, Bead, cutlery, Flatware, forks, Grecian, Harley, Kings, knives, Spoons, Stellar. Bookmark.